First STEP (Striving Towards Excellence Program) connects first year students with Academic and peer mentors within the Faculty of Business and Economics, to give students a chance to get some advice from those who have done it all before. The Launch event kicks off the program. Students meet their peer mentor and fellow students for the first time, are introduced to their Academic and network over light refreshments. We were honoured to have Professor Sherman Young, Pro Vice-Chancellor of Learning, Teaching and Diversity as a guest speaker at the official launch event for Session One, 2015. We also heard from Hamid Yahyaei a current peer mentor in the program. 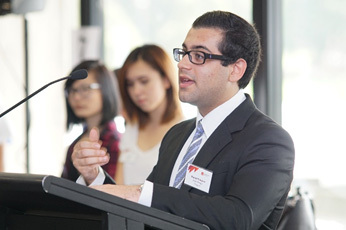 Hamid participated as a first year student, and has also been a peer mentor. "Ladies and gentleman, my name is Hamid. I do have a last name, but let's not stay here all day trying to pronounce it. I'd like to talk to you all about a thing called Life, and more importantly, ladies and gentlemen, the fact that life is a finite concept. Every single human who exists and every human who will exist will face the cold harsh truth that we cannot live forever. Now before you think that I'm going to spend the next few minutes ruining your day with pessimistic views, just hear what I have to say. The people in whom we idolize, the people we call great successes and achievers, the people who have broken world records or have made great fortunes from nothing, these people all share a common trait. This common characteristic is relative to the fact that these people realise that time is both the greatest asset in which we have and in fact the greatest enemy. No one has the ability to stop time, it doesn't take a PhD in quantum mechanics to realise that we are a couple thousand years away from cracking the secrets of time dilation, now I'm not a scientist, but I do know one thing. I know that with the right guidance, with passion, with determination and a constant inherent ability to follow your dreams, time can be used to its greatest of potential." "As each second goes on, we grow older. Yet as each second goes on, we also have the ability to build the foundations and stepping stones necessary to live the lives we have always imagined and one of the necessities required to head towards success is building a relationship with a mentor. A mentor is someone who will stand in your corner, give you guidance, remind you that although the hardships and downturns of life may seem unbearable, there is a silver lining in every situation and you will believe them when they make this statement, for they have been through and conquered the very doubts you may hold." "Throughout my years as both a mentor and a mentee, I have come to make the realisation that although you may find yourself completely alone facing the cold silence of the boundaries which life may throw in your direction, there will always be someone you can turn to. I have found myself many times questioning my abilities, the actions which I am undertaking and my life as a whole, only to find solace in the words of someone who I call my mentor. Through the promoting words of my mentor I was able to land myself an internship this past summer as a Financial Analyst at a Hedge fund called Spectrum Asset Management and as of recent I was allowed to remain at the firm as a part time Financial Analyst. It was my mentor who made me believe that I could land such a position and it was my mentor who acted as my reference to secure the position." "But it is not just my mentor for which I have turned to for advice; over the years the people whom I have mentored have in return taught me just as much. This goes to show the beauty of a mentor and mentee relationship. It is truly a two way street which provides just as much satisfaction to the mentor as it does to the mentee." "University is a time for reinvention, a time to not only learn about whatever it is you desire in this world but it is also a time to realise that we are all indeed facing this transition into the next chapter of our lives, together. Each and every one of you in this room has taken the first step, no pun intended, to unlocking the secrets towards your own potential. If there are any motivational words that I can leave you with, it is the following. Live your life with passion, do not allow anyone to question your dreams, bring people into your life that raise you up and realise that this is it, this is your life and whatever it is your heart desires in the world can be made into reality." "From me to you, welcome to the First-Step Mentoring program and more importantly, welcome to Macquarie University. We have over 20 academics and peer mentors from all four departments volunteering their time to support more than 100 first year students taking part in the program this session." 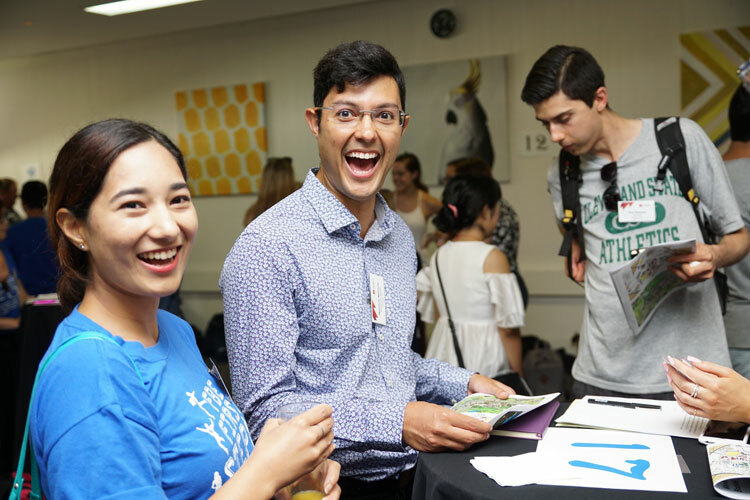 In addition to the launch event, students participated in a joint BBQ with other FBE programs and student societies, a first year careers event and individual group activities organised by their peer mentor. Last Updated: 2015-06-30 14:31:54 by Unknown.